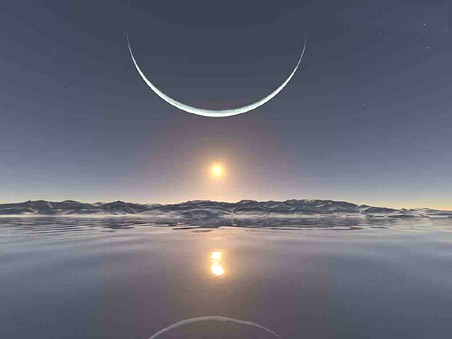 This is SUCH a great Solstice pic - over the snow and ice. And I must admit that I adore Stonehenge at Solstice. What's not to like? Things finally came together this year, although I would have loved things clicking into place just a bit earlier (sigh). The cut-out cards that I really wanted to send never worked so I shifted designs, changed from blade to pens, and used my "fancy" equipment to draw designs and to write poetry and sentiments in the card. Then I applied Swarovski crystals, added decorative braid, and embossed things in the interior. I will be including something special in some of the cards, just open carefully :-) Happy Holidays and Good Solstice to all! Current Location: Shower, coffee, writing - how perfect! I really do love these two. Nothing makes me much happier than looking at beautiful pictures. I especially like the moon pic. I think they are both amazing, but the moon pic is one of my favorites. Although I adore the sun, I am fascinated by the moon. 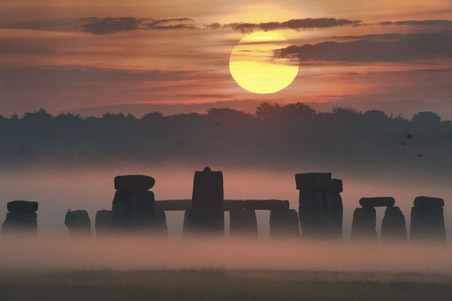 I do love the Stonehenge picture - and as so many of the current theories tell us it was made for Winter Solstice, not Summer, it's absolutely perfect for the season. Was it really? What fun! I love Stonehenge, although Avebury is closer to my heart. When I was last in England I drove all over the place, and both of the henges were on my route. They were so worth the visit.